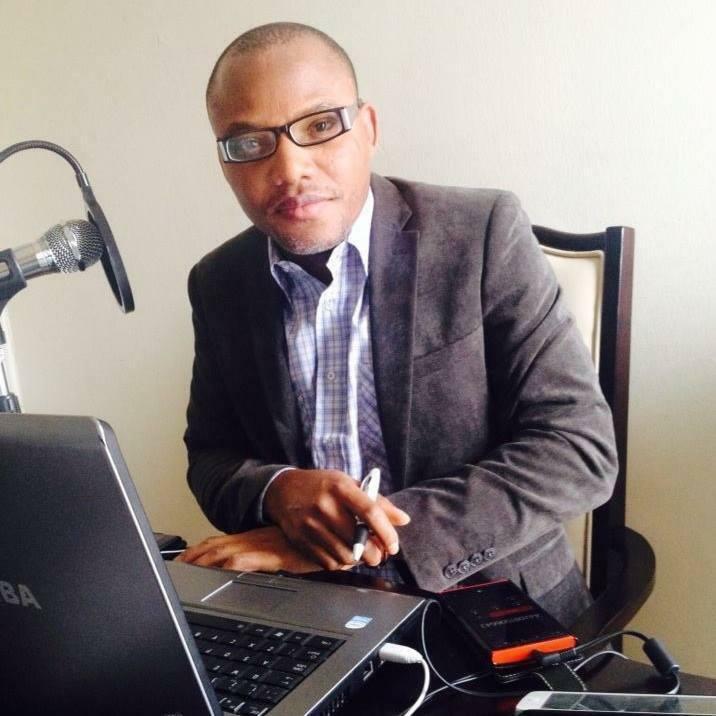 See excerpts from Radio Biafra founder’s father recent chat with Saturday Sun. While talking about his son’s detention, (Eze) Israel Okwu Kanu (JP) the royal father of Isiama Afara,in Umuahia,Abia state said his son will rather die than stop fighting for Biafra. “Nnamdi is my first son. His arrest pains me a lot; it is not when I start crying like a child before people will know that his arrest is paining me to the marrow. That chap has no problem, he is not a noisemaker, rather he abhors injustice. Since he was born, he had not exchanged words with we, the parents or even the siblings, always sitting quietly when we are having family meetings, but he always made quality inputs”. “It was not justified at all be­cause he is fighting for the freedom of the Igbo with his mouth and without a machete or gun. It is only that mouth Nnamdi is using to demand the freedom of the Igbo and whether the Federal Government likes it or not, he will continue to speak just as I used to do which made me to represent my people three times as a local government councillor. Talking runs in our blood stream and it will be difficult for Nnam­di to stop talking”. You are the most *****human.being on.planet earth for calling a Royal Majesty.a fool can say same to an Emire wiithOut losing your head?? But I assur you God wil handle you himselfe. You are right, the talking that runs in their family’s blood now landed him in jail. Like father like son, u should be ashamed of your self to have stand in defence of your useless son. Mazi Nnamdi or what ever your name is, can you warn your that boy/son that he should keep quiet and stop causing problem, he just a nuisance, ask him to go back to the village & start farming, he shouldn’t destroy our igbo community for us. Mazi Nnamdi Kanu has been granted bail with a condition to go with, why are those miscreants demonstrating in the South East not addressing the bail terms and rather chose to disturb the public peace with senseless demonstrations that leads their agitative course nowhere. Its very pathetic no bold South Eastern top civil servant is ready to put his job on the line for the release of Mazi Nnamdi Kanu thus, clearly shows re-enacting the Biafran civil war will serve no Igbos interest anyway. I doubt if those misguided hoodlums in the South East are thinking right and acting in the interest of Igbos countrywide and across the world. However, if their agitations ever succeeded and a sepatate Biafran State is carved out of the present Nigeria; that new country will certainly be further segregated into smaller clanish constituencies, going by the unbriddled greed of the people of the South East. Obodo or what ever you call yourself, your family will never run shot of foolishness they your generations to come ends miserably for abusing a royal father crying for his son which is illegally detained by an analog president. Warn your son to keep quiet and stp creating fight in Naija,if he dosen’t av anything to do let him go the the village & start farming. Ur d cause of his problem. Encouraging his stupid venture. I think that Eze Okwu Kanu is enjoying the unnecessary attention his senseless, uncultured and rude boy is generating in Nigerian media. The father claimed that his son is fighting for justice and freedom of millions of Ndigbo people with the words of his mouth and not with cutlasses or guns. It is a pity that this guy-Nnamdi behaviors, think, acts and sounds like his father, like father like son scenery. The Eze doesn’t know or pretend not to know that the words of mouth can lead to war,civil unrest, conflicts, riots, and total disrespect or collapse of laws and order of the land. It also surprised me that Eze Kanu also lives and dwells in Abia state which is part and parcel of the zoo called Nigeria according to his noise maker son. I’m of opinion that Mr. Nnamdi Kanu should remain quietly in Nigerian maximum prison until the State Security Services determine that his threats of war, lies propaganda on that illegal Radio Biafra, and his claimed of training thousands of armed militants outside Nigeria are all empty threats. Your royal highest sir, your son is too irrelevant, uncultured, mannerless, dumb, and highly immature to represents the collective interests of millions of great Ndigbo people scattered all over the nation. Until Kanu’s threats are neutralize, he should remain in the prison of the zoo. What a shame! You are a very stupid person, u don’t know that there was a country before Nigeria go and familiarise yourself with (United Nation Declaration on the Rights of Indigenous Peoples). We are not one and we can never be one, I don’t blame you because no ofemmanu person has the ball to do what Nnamdi is doing, Nigeriahas expired after 100years of treaty signed 1914 amalgamation, Even CIA of America Quoted that Nigeria will disintegrate come 2015 . You are happy with one Nigeria with book haram ..
@Danison, chidis, A.z and pita c u must either be related to that racist bigot or stand to gain from your ill conceived “biafra” or simply like most black idiots simply to are just to lazy to subject anything to reason and just follow follow. What people need is love and ways to break down barriers not more division which will by the way not profit the people that your claim to protect. For example, your people are entrepreneurial and they have been smart enough to own over 70% or land in abuja so what will happen when u form “biafra” because u know abuja will now become another country for them. I know you will respond with insults because that is obviously what your father thought you rather than to use your brain but remember that whatever you do it is your people that will suffer it. N.B Igwe, why are you say your son de quiet and he never quarrel before for him life? shey na battery he de use ni? Shut up old fag you should be arrested too. Racist he goat, like father like son. Only idiots will marry ****s.
Is this talk of Biafra what we need in Nigeria right now? I seriously doubt it. We need to focus on making this country grow, reducing corruption and ensuring that we gradually rise from the country that receives aid for practically everything to one that gives aid. I am always also hesitant about following a person who has an escape route while I don’t have any. Mr kanu is in possession of dual citizenship, when the going gets tough, his ‘toughness’ can get him going back to U.K. We honestly donot need anything that will destabilise this already fragile country.Besides, the investment of Igbos in other parts of Nigeria outside their homeland should get them to take a pause. Perhaps this might not be the best road to take.